OUR MISSION: In our 14th year we, at The Journal of Equine Dentistry, strive to be an educational forum, through which all participating parties in the equine dental industry may share experiences, methods, knowledge and new products. Stephenie Carpenter is the owner and editor of The Journal of Equine Dentistry. Growing up on a cattle ranch in Montana, horses were a way of life. Stephenie comes from a background in graphic design and her interest in equine dentistry grew after being hired, in 1997, to build one of the first websites dedicated to equine dentistry. In 1999 she became further involved in all processes by photographing and documenting in-class lab cases at the Academy of Equine Dentistry. Her duties further evolved to include assisting instructors with lecture preparations. Stephenie is also in charge of electronic training media for the Academy and produced equine dental instrument catalogs, the Introduction to Equine Dentistry CD, diagrams on the equine head, and equine dental forms. In 2000, she acted as a driving force behind The Journal of Equine Dentistry and today she continues to be a part of the educational process by publishing The Journal. Bernard Fletcher DVM is from Bennington, Nebraska. Dr. Fletcher attended veterinary school at Kansas State University, where he also worked as an intern in the equine department. He obtained advanced training in equine surgery through selective continuing education courses. Dr. Fletcher is certified in acupuncture through IVAS, and also received advanced training in equine chiropractics. His interest in equine dentistry and oral surgery began in 1984, during his first specialized training in equine dentistry. In the last decade, Dr. Fletcher's techniques using local anesthesia, to aid in the process of dental treatments, revolutionized standing dental surgeries and oral extractions - his publications on this subject were first published at the 2005 AAEP conference. Several radiographic techniques, developed by Dr. Fletcher, are instrumental in formulating proper diagnoses of oral disease in horses. He continues to receive numerous invitations to lecture at many major equine dental conferences. Dr. Fletcher is one of three associate editors for The Journal of Equine Dentistry. John Fortkamp CEqD, is originally from Ohio. He travels all over the United States, Hawaii, and Costa Rica working on english and western performance horses. He has also worked on horses in Australia, South Africa, and England. John lectures about equine dentistry to further the knowledge of various organizations, including the Student Chapter of the American Association of Equine Practitioners at Colorado State University and the International Association of Equine Dentistry. John currently serves as the Dean of students at The Academy of Equine Dentistry, in addition to being a full-time lecturer and wet-lab instructor. Throughout his years at The Academy, John's assistance in pioneering many techniques continues to advance the field of equine dentistry. Nick Moore DVM lived a childhood with horses on a ranch in south-central Montana. His experience in training and shoeing horses led him to veterinary school at Colorado State University. Dr. Moore boasts specialty training and over a decade of experience in equine dentistry. His work in this area finds him in and throughout over the US and abroad. He is one of a select few equine veterinarians that specialize in standing oral extractions and minimally invasive oral surgeries. Following graduation from veterinary school, Dr. Moore obtained advanced training in equine medicine and surgery by completing an internship at the Arizona Equine Medical and Surgical Centre. His primary interests include equine dentistry and equine sports medicine. Having worked and trained as a farrier, Dr. Moore also holds a strong interest in equine lameness and podiatry. He founded Moore Equine with the intention of providing state of the art equine medicine in a mobile setting. As such, he is able to offer services that were previously only available in a hospital setting. For example, high quality digital x-rays, ultrasound, and endoscopy are routine services provide daily through his mobile field services. He is a member of the American Association of Equine Practitioners, the International Association of Equine Dentistry, the American Veterinary Medical Association, and the International Society of Equine Locomotor Pathology. Briana J. Burge CEqD joined The Journal staff in 2013. After two years of study and internship, she joined the international community of equine dental practitioners through earning her certification at the Academy of Equine Dentistry. Briana possesses a brief background in journalism, having studied the subject at the University of Montana. Writing is a passion of hers, and therefore it is with true enthusiasm she serves to help produce the best possible written representation of both her field and peers. Briana's intent is to act as writer, ghostwriter and assistant editor for the Journal. There exists a great importance for educated, informative and research-based writing in most every field of study and practice; for this reason, Briana joins the team at The Journal of Equine Dentistry. Those who dedicate their time, effort, knowledge, and skill-set to the Journal, rely on the support of this career-based community. Through this venture, she hopes to assist The Journal as it continues to prosper and to serve dental practioners and the horses they treat. The Journal boasts the contribution of many writers over the years. As we look forward to the coming editions, I would like to take a step back to thank those of you with submissions in past journals. Your contributions play an enormous role in spreading knowledge and information on this subject around the world. The Journal of Equine Dentistry gives us an opportunity to come together and to share. This level of participation encourages us to pull together and make progress. Sharing information is a vital way for everyone to learn from one another. It is our responsibility as individuals to do our best, show courtesy for the opinions of others, and set a good example. We are all in this profession together, sharing a desire to serve the horse. Our personal reflections are reflections of the profession. One of the greatest gifts we can give the horse is to continue to improve ourselves by participating in the educational process. The Journal allows everyone the opportunity to participate. Please make it your personal responsibility to join us by contributing information in order to improve the industry. Our intent is to publish information for public awareness, construct a forum where ideas can be exchanged and to highlight important issues in this rising industry for everyone's benefit. As always, the invitation to submit articles is open to all and I would like to encourage everyone to participate. 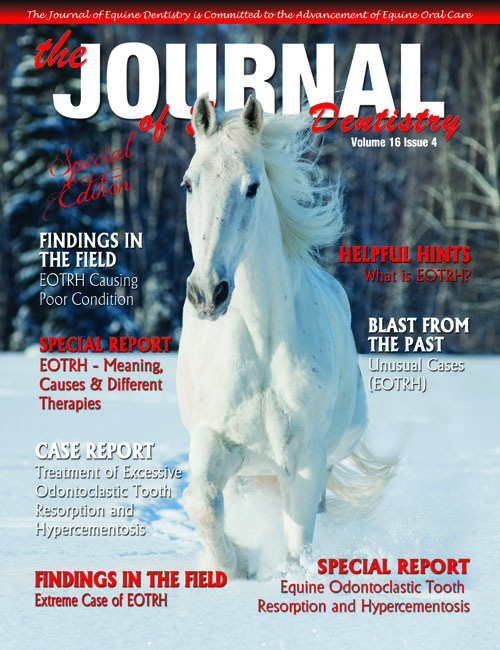 Please email submissions to The Journal of Equine Dentistry at journal@equinedentistry.com.